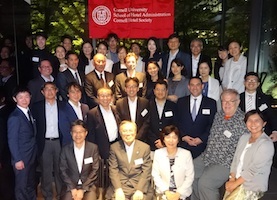 CHS Japan held an Annual General Meeting & New Year’s Party on Friday, February 8, 2019. The Japan Chapter celebrated the 90th anniversary of CHS at a brand new Indian restaurant operated by a Cornellian. On Friday, February 17, 2017, the Tokyo and Kansai chapters gathered together to celebrate the New Year. On February 27, the CHS Kansai Chapter welcomed Professor and Mrs. Rohit Verma with a reception at Kyoto University. A total of 36 Cornellians and their guests attended the event. 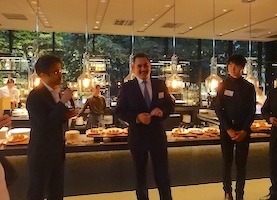 On November 16, 2017, the CHS Tokyo chapter hosted an Autumn Terrace Party at the Trunk (Hotel).